Leland Max Kimbrell was a sailor during World War II and died at sea. According to a roster of World War II dead, he was a Fireman 2nd Class in the Navy Reserve and was reported missing/presumed dead on 17 October 1945. --Cleone Rose (Kimbrell) Gruber (1923-2007)--married to Everett "Ed" Gruber in Carroll County, Indiana in 1940. Any information on this family would be appreciated. My great-grandfather, Conrad Dietzel, was born in Bad Neuenahr, Germany in 1823, and died in Lawrenceburg, Dearborn County, Indiana in 1910. He was married to Elisabeth Fuss (born 1827 in Schlitzenhausen, Germany; died 1903 in Lawrenceburg, Dearborn County, Indiana). Both are buried in Greendale Cemetery in Dearborn County. They arrived in the United States in 1853 and they apparently were married after they arrived in Indiana. They settled in Lawrenceburg in Dearborn County and lived there the rest of their lives. I am trying to find when and where in Indiana they were married. I am looking for information regarding my great-grandfather, Joseph Jones Maxwell. He moved his family to Laurel, Franklin County, Indiana in 1901. There they lived and worked on the Twitchler farm. At one point they had a large white home in town. Supposedly he had a school in town named after him also. I am interested in any information on him, or any pictures of the school. Here are some statistics on our Indiana marriage indexing project through the end of November. 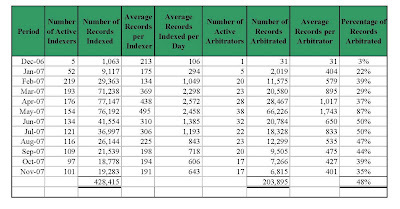 As you might expect, the pace has slowed down a little for the holidays, but our wonderful volunteers still managed to index more than 425,000 records. The North Webster Public Library will host a Genealogy Roundtable on January 14 from 10 am to noon in their Local History and Genealogy Center. The public is welcome to come and share their research tips, as well as their genealogy "brick walls." James Duncan came to Indiana in 1815 and settled in Sparta Township, Dearborn County. He was born in Maryland in 1796 (in what part of Maryland, I do not know) and he died in Manchester, Dearborn County, Indiana November 17, 1864. He was married to a Martha ?? They had six children: John, Henry, William, Ann, Elizabeth, and Joshua who was born in 1833. All were born in Dearborn County, and then in 1834 James Duncan married again to a Molly Smith. James Duncan and Molly Smith had four children: Josiah (born 1835), James (born 1837), Robert (born 1839), and Thomas (born 1841). I'm trying to find out where in Maryland James Duncan was born, and also who his parents were, and where they came from. I'm looking for information about my great-grandfather, Harrison Utley, who was born around 1855 in Posey County, Indiana. He married Mary Byrd in 1879 and they lived in Mt. Vernon. Their daughter Cora Utley Wilson is my paternal grandmother. Seeking information on the parents of Elijah McCollum, born about 1855 in North Carolina (?). He married Catherine Wine on September 4, 1872 in Randolph County, Indiana and is buried in Fountain Park Cemetery in Winchester, Indiana. He was my great-grandfather and is my brick wall. I'm looking for the date of death/death record for George S. Rush (aka George L. Rush). He was born in 1879 in Chester Township, Wells County, Indiana to William and Catherine Rush, and married Rebecca Long in December 1903. They had children Fred and Mary (twins, born November ?23? 1906) and Sarah (born 1909). His last known whereabouts was in Pulaski County, Indiana in 1909. I'm searching for information on my wife's grandfather, Robert Dawson (born about 1832), who was in the Civil War. We are told he was in Company K of the 123rd Indiana Infantry. Any information would be appreciated as all of my searches have came up empty. We would like to know the county in Indiana where he enlisted as well and something about the battles he may have been involved in. Thank you in advance for your help. The Wabash Valley Genealogy Society will hold a 4-week series of Genealogy Beginner Classes from 6 to 8 pm Tuesdays, beginning February 5, 2008, at the Vigo County Public Library in Terre Haute. There is a $5 charge to attend all 4 classes, which includes handouts and a CD of Legacy genealogy software. The Wabash Valley Genealogy Society, which represents the interests of genealogists in Vigo County and the surrounding counties of west central Indiana, will hold a program on Civil War Records on January 14, 2008 from 6:30 to 8:30 pm at the Vigo County Public Library in Terre Haute. Ron Darrah will be the speaker. The program is free and open to the public--there will be handouts, door prizes and refreshments available. The Northwest Indiana Genealogical Society (which represents the interests of genealogists in Lake and Porter counties) will meet January 19 at 10 am at the Lake County Public Library in Merrillville, Indiana for their annual "sharing" event. Attendees are invited to bring a document or memento to show and discuss, or a question to ask about some of the “brick walls” in their research. I am seeking information about David and Sarah Leslie of Shelby County, Indiana. They moved to Shelby County, Indiana from Ohio between 1846 and 1849 with their children Gabriel, Mary, Ann, Maria, and William, and they had a daughter, Margaret (Leslie) Hill after moving to Indiana. In the 1870 census, David is not listed with Sarah, and he is not buried with her in the St. George Cemetery in Shelby County. Sarah died October 12, 1876, and is buried with the babies of Isaac and Margaret Heck. Seeking information on John Loy who died April 20, 1859 in Pendleton, Madison County, Indiana and his wife Elizabeth who died February 1, 1885 in Pendleton. Their sons Isaac and Jacob Loy moved to Hancock County, Indiana after 1850. I am looking for any information on two members of the Kellems family from Perry County, Indiana. The first is Russell M. Kellems, born 1892 and moved to Indianapolis and began work at the Transportation Company as a motorman on a streetcar. He lived at one time at 28 South Holmes Ave. in Indianapolis--the last known information was 1914. The other is Ruby H. Kellems (a male), born 1899 in Perry County, Indiana. Their father was William Hinch Kellems (born 1867) and their mother was Sarah Hobbs (born 1868)--finding out the date and place of their deaths would help greatly. I am searching for an obituary or date of death for Henry Ripke (born May 1845) and his wife, Mary Ripke (born October 1853), who were last seen in the 1920 census for Adams Township, Allen County, Indiana. I would also like to make contact with any of their living descendants. I believe that Mary may be a sister to my great-grandfather. I am also searching for living relatives of Edith "Ida" (Dearmin) Saneholtz, who was born June 17, 1898 in Johnson, Indiana and died May 6, 1979 in Anderson, Madison County, Indiana. Edith was married to Fred C. Saneholtz, my great-uncle. I am trying to contact his grandchildren for family tree information. Looking for the parents of Jesse Wright Myers (born 24 January 1818 in Clay County, Indiana; died 3 March 1898). He was married 2 January 1842 in Union County, Indiana to Katherine Keller (born 8 January 1819 in Virginia or Clay County, Indiana; died 26 August 1868). I have information on some of their descendants that I can share, but need help on their ancestry. Searching for information on William E. Horner, who was born 1 December 1798 in Gloucester County, New Jersey and died on 2 December 1872 in Fredericksburg, Washington County, Indiana. He married Sarah Elizabeth Royce in Fredericksburg on 27 May 1819. He is listed in the 1850 census in Jackson Township, Washington County, Indiana. His parents were possibly Jacob Spicer Horner (1773-1872) & Rebecca Ann Eastlack (1776-1811). Searching for information on the ancestors of George M. Horner (born 20 January 1825 in Posey Township, Washington County, Indiana; died 17 May 1898 in Pinckneyville, Illinois). His parents were William E. Horner (1798-1872) and Sarah Elizabeth Royce (1803-1866). He married Sarah Ann Smith in Harrison County, Indiana on 14 March 1850. I am trying to find information about the ancestry of a Hugh C. Funk born 1818-1823 (depending on census reports). He was born in Indiana on his father's farm. I know he was married in 1846 to L. Lewis in New Albany, Floyd County, Indiana. I know his occupation--river pilot--and other info from the census records. His daughter, Sarah, burned all his papers at his death, so no one knows who his parents were. The Indiana Genealogical Society welcomes Dona Stokes-Lucas of Indianapolis as the new IGS Central District Director. District Directors act as liaisons, relaying information on the activities, news and concerns of individuals and genealogy-related organizations in their area, including Indiana County Genealogists. The Central District Director represents the interests of those in Boone, Clinton, Hamilton, Hendricks, Johnson, Marion, Morgan and Tipton counties. My great-grandfather, Samuel A. Myers, made a breadboard for the wedding of Jacob Barkley Myers and Phoebe Warner in March 1884. I think they were married in Angola, Steuben County, Indiana. They had only one daughter, Violet Esther Myers (born October 1896 in Salem Township; died 22 November 1995). Violet Myers married Paul Revere Swift in Pleasant Lake, Steuben County, Indiana. They had 2 sons: Kermit Schofield Swift (born 22 May 1917) and DeVon Dureath Swift (born 10 June 1928). DeVon Swift married Alice Imogene Taylor and they had a daughter, Deborah Ann Swift (born 14 August 1951 in Fort Wayne, Allen County, Indiana). Deborah Ann Swift married Dale Patrick Johnson from Newport, Texas, on 6 August 1968 in Alexandria, Madison County, Indiana. Dale and Deborah (Swift) Johnson had a daughter, Jennifer Lynne Johnson (born 7 February 1967 in Alexandria, Madison County) and a son, Jason Patrick Johnson (born 11 July 1973). Kermit Swift married Virginia Kathryn Tucker and they had one daughter, Kathryn Ann Swift (born 1 December 1948 in Fort Wayne). Kathryn Ann Swift married Richard Michael Ronan (born in Chester, Pennsylvania) on 15 December 1979 in California. They had one child, Michael Patrick Ronan (born 9 May 1981 in California). I now have this breadboard from 1884, as well as a photo of Violet (Myers) Swift with her granddaughter, Jennifer Lynn Johnson. After Violet's death, there is no family record (Myers-Jones Reunion in Henry City, Ohio) that exists. My sister, Rose Rombeiro, researched over 5,000 family names before her death and one of her last requests was to convey this breadboard to a female Myers relative, something which Violet had also earlier requested. Any aid would sure be appreciated! Thanks. Eunice CRAMPTON, probable daughter of Samuel and Anna CRAMPTON, married Alexander TEMPLE on 25 March 1847 in Wayne County, Indiana. Samuel CRAMPTON lived in New Garden, Wayne County, Indiana in 1840. By 1850, Samuel and Anna Crampton had moved to Salem Township, Henry County, Iowa and were neighbors of Alexander and Eunice (CRAMPTON) TEMPLE. Merrich and Joshua CRAMPTON were also listed in the 1840 census in Wayne County. I am searching for more information about Eunice CRAMPTON. Thanks! The Indiana Genealogical Society recently appointed Nancy Massey as the Indiana County Genealogist (ICG) for Hamilton County. Nancy has worked in the Indiana Room of the Hamilton East library in Noblesville for the past 15 years. She has compiled several subject guides to assist library patrons and indexes obituaries and other items from local newspapers. She also created and helps maintain a master database of area cemeteries. A frequent speaker at genealogy events in central Indiana, she is also a past winner of the IGS library scholarship. Nancy is also on the Board of Directors of the Hamilton County Historical Society and since 2004, has been an assistant to the Hamilton County Historian Joe Burgess. In her spare time, she does lookups and answers queries for the Hamilton County website of the USGenWeb Project. The Allen County Genealogical Society of Indiana will meet on Wednesday, December 12 at 6:30 pm at the main branch of the Allen County Public Library in Fort Wayne. There will be a show & tell, where members will share information about an artifact or heirloom they have brought with them. Guests are welcome.